112mm long, 2mm pitch belt, tooth height 0.51mm, belt thickness 1.14mm. Closed Loop. Manufactured from synthetic neoprene. ..
1170mm long, 2mm pitch belt. 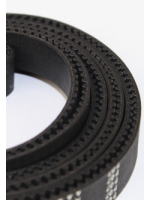 0.51mm, belt thickness 1.30mm. Closed Loop. Manufactured from synthetic neoprene. ..
1445mm long, 2mm pitch belt. 15mm width. Closed Loop Manufactured from synthetic neoprene. ..
1569mm long, 3mm pitch belt. 15mm width. Closed Loop Manufactured from synthetic neoprene. ..
2160mm long, 3mm pitch belt, 15mm width, belt thickness 2.40mm. Closed Loop. Manufactured from neoprene rubber with fiber glass core. ..
2250mm long, 5mm pitch belt, 15mm width, belt thickness 3.80mm. Closed Loop. Manufactured from neoprene rubber with fiber glass core. 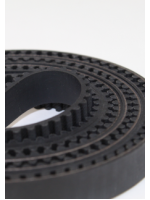 ..
2388mm long, 3mm pitch belt, 15mm width, belt thickness 2.80mm. Closed Loop. Manufactured from neoprene rubber with fiber glass core. 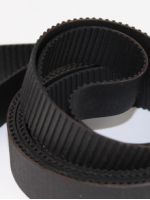 ..
240mm long, 3mm pitch belt, 15mm width, belt thickness 2.35mm. Closed Loop. Manufactured from neoprene rubber with fiber glass core. ..